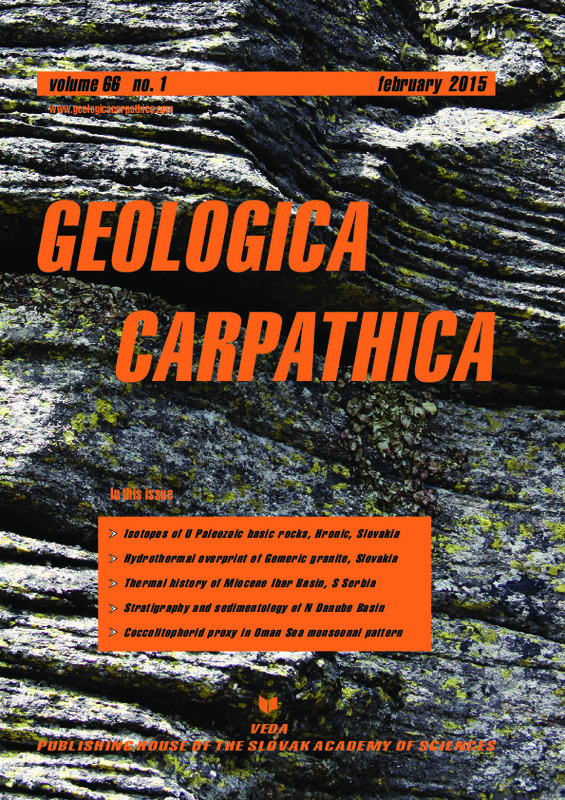 Abstract: The paper presents new major and trace element and first Sr-Nd isotope data from selected lavas among the Permian basaltic andesite and basalts of the Hronicum Unit and the dolerite dykes cutting mainly the Pennsylvanian strata. The basic rocks are characterized by small to moderate mg# numbers (30 to 54) and high SiO2 contents (51—57 wt. %). Low values of TiO2 (1.07—1.76 wt. %) span the low-Ti basalts. Ti/Y ratios in the dolerite dykes as well as the basaltic andesite and basalt of the 1st eruption phase are close to the recommended boundary 500 between high-Ti and low-Ti basalts. Ti/Y value from the 2nd eruption phase basalt is higher and inclined to the high-Ti basalts. In spite of this fact, in all studied Hronicum basic rocks Fe2O3* is lower than 12 wt. % and Nb/La ratios (0.3—0.6) are low, which is more characteristic of low-Ti basalts. The basic rocks are characterized by Nb/La ratios (0.56 to 0.33), and negative correlations between Nb/La and SiO2, which point to crustal assimilation and fraction crystallization. The intercept for Sr evolution lines of the 1st intrusive phase basalt is closest to the expected extrusions age (about 290 Ma) with an initial 87Sr/86Sr ratio of about 0.7054. Small differences in calculated values ISr document a partial Sr isotopic heterogeneity source (0.70435—0.70566), or possible contamination of the original magma by crustal material. For Nd analyses of the three samples, the calculated values εCHUR (285 Ma) are positive (from 1.75 to 3.97) for all samples with only subtle variation. Chemical and isotopic data permit us to assume that the parental magma for the Hronicum basic rocks was generated from an enriched heterogeneous source in the subcontinental lithospheric mantle. Abstract: A unique case of low-temperature metamorphic (hydrothermal) overprint of peraluminous, highly evolved rare-metal S-type granite is described. The hidden Dlhá dolina granite pluton of Permian age (Western Carpathians, eastern Slovakia) is composed of barren biotite granite, mineralized Li-mica granite and albitite. Based on whole-rock chemical data and evaluation of compositional variations of rock-forming and accessory minerals (Rb-P-enriched K-feldspar and albite; biotite, zinnwaldite and di-octahedral micas; Hf-(Sc)-rich zircon, fluorapatite, topaz, schorlitic tourmaline), the following evolutionary scenario is proposed: (1) Intrusion of evolved peraluminous melt enriched in Li, B, P, F, Sn, Nb, Ta, and W took place followed by intrusion of a large body of biotite granites into Paleozoic metapelites and metarhyolite tuffs; (2) The highly evolved melt differentiated in situ forming tourmaline-bearing Li-biotite granite at the bottom, topaz-zinnwaldite granite in the middle, and quartz albitite to albitite at the top of the cupola. The main part of the Sn, Nb, and Ta crystallized from the melt as disseminated cassiterite and Nb-Ta oxide minerals within the albitite, while disseminated wolframite appears mainly within the topaz-zinnwaldite granite. The fluid separated from the last portion of crystallized magma caused small scale greisenization of the albitite; (3) Alpine (Cretaceous) thrusting strongly tectonized and mylonitized the upper part of the pluton. Hydrothermal low-temperature fluids enriched in Ca, Mg, and CO2 unfiltered mechanically damaged granite. This fluid-driven overprint caused forma- tion of carbonate veinlets, alteration and release of phosphorus from crystal lattice of feldspars and Li from micas, precipitating secondary Sr-enriched apatite and Mg-rich micas. Consequently, all bulk-rock and mineral markers were reset and now represent the P-T conditions of the Alpine overprint. Abstract: The Ibar Basin was formed during Miocene large scale extension in the NE Dinaride segment of the Alpine- Carpathian-Dinaride system. The Miocene extension led to exhumation of deep seated core-complexes (e.g. Studenica and Kopaonik core-complex) as well as to the formation of extensional basins in the hanging wall (Ibar Basin). Sedi- ments of the Ibar Basin were studied by apatite and zircon fission track and vitrinite reflectance in order to define thermal events during basin evolution. Vitrinite reflectance (VR) data (0.63—0.90 %Rr) indicate a bituminous stage for the organic matter that experienced maximal temperatures of around 120—130 °C. Zircon fission track (ZFT) ages indicate provenance ages. The apatite fission track (AFT) single grain ages (45—6.7 Ma) and bimodal track lengths distribution indicate partial annealing of the detrital apatites. Both vitrinite reflectance and apatite fission track data of the studied sediments imply post-depositional thermal overprint in the Ibar Basin. Thermal history models of the detritial apatites reveal a heating episode prior to cooling that began at around 10 Ma. The heating episode started around 17 Ma and lasted 10—8 Ma reaching the maximum temperatures between 100—130 °C. We correlate this event with the domal uplift of the Studenica and Kopaonik cores where heat was transferred from the rising warm footwall to the adjacent colder hanging wall. The cooling episode is related to basin inversion and erosion. The apatite fission track data indicate local thermal perturbations, detected in the SE part of the Ibar basin (Piskanja deposit) with the time frame ~ 7.1 Ma, which may correspond to the youngest volcanic phase in the region. Abstract: High abundances of coccoliths have been observed in surface sediment samples from near the coasts of the Oman Sea in February 2011. At the end of the NE monsoon, the locally observed high Gephyrocapsa oceanica produc- tion is hypothesized to respond to local injections of nutrient-rich deep water into the surface water due to sea-surface cooling leading to convection. The most abundant coccolithophore species are G. oceanica followed by Emiliania huxleyi, Helicosphaera carteri, Calcidiscus leptoporus. Some species, such as Gephyrocapsa muellerae, Gephyrocapsa ericsonii, Umbilicosphaera sibogae, Umbellosphaera tenuis and Florisphaera profunda, are rare. The G. oceanica suggested a prevalence of upwelling conditions or high supply of nutrients in the Oman Sea (especially West Jask) at the end of the NE monsoon. E. huxleyi showed low relative abundances at the end of the NE monsoon. Due to the location of the Oman Sea in low latitudes with high temperatures, we have observed low abundances of G. muellerae in the study area. Additionally, we have identified low abundances of G. ericsonii at the end of the NE monsoon. Helicosphaera carteri showed a clear negative response with decreasing amounts (relative abundances) at the end of the NE monsoon. C. leptoporus, U. sibogae and U. tenuis have very low relative abundances in the NE monsoon and declined extremely at the end of the NE monsoon. F. profunda, which is known to inhabit the lower photic zone ( < 100 m depht) was rarely observed in the samples.